Seeing Vietnamese language as a tough challenge that prevents ethnic children from going to school, the education sector in the northern mountainous province of Lao Cai has directed local education facilities to focus on the child-centered training approach, and create favourable conditions for them to identify and pronounce Vietnamese anytime by sticking alphabets and words on toys. 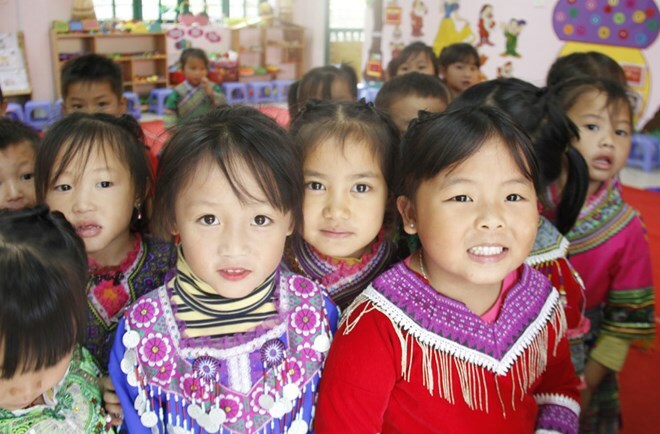 Currently, more than 39,000 children at 175 kindergartens and over 1,800 child care groups are equipped with Vietnamese listening and speaking skills. Meanwhile music composition, puzzles, traditional games, and folk literature are encouraged in kindergartens in the central province of Thua Thien-Hue to develop Vietnamese language for children. Considering Vietnamese language teaching as a core mission of the local education sector, the Central Highlands province of Dak Lak has organised many training courses to improve capacity for 150 managerial officials and 500 teachers. Besides, it has called for support from domestic and foreign organisations and individuals for Vietnamese teaching for ethnic children. However, shortage of teachers has affected the quality of education while many teachers are perplexed in choosing rational teaching methods. According to deputy head of the Ministry of Education and Training’s Pre-school Education Department Nguyen Thi Hieu, localities should pay attention to building libraries at kindergartens to create an environment for Vietnamese language communication. She suggested heavy investment in teaching aid to better pronunciation for children. Lunch support for both pupils and their teachers is recommended to ensure that they attend school the whole day and have more time for Vietnamese teaching and learning.